SAN JOSE, CA--(Marketwire - April 29, 2008) - RAE Systems Inc. (AMEX: RAE), a leader in delivering innovative sensor solutions to serve industrial, energy, environmental, and government safety markets worldwide, today introduced the QRAE II Pump. This new model joins the QRAE II Diffusion introduced last year and offers fast response times required for safe confined space entry. The QRAE II is a full-featured, compact, one- to four-sensor toxic gas detector for oxygen, combustibles, hydrogen sulfide, carbon monoxide, or sulfur dioxide. Key features include an easy-to-change battery pack, a water-resistant case, and a new state-of-the-art, solid-polymer electrochemical (SPE), lead-free oxygen sensor. The QRAE II Pump has international certifications for use in hazardous environments including oil refineries, petrochemical plants, steel mills, wastewater treatment plants, landfill operations, coal mines, sewers, trenches, and other confined space entry operations. "The QRAE II is the first product to use our patented solid polymer oxygen sensor. This lead-free next-generation sensor boasts a longer life and RoHS-compliance," said Thomas Negre, RAE Systems' Global Product Director for Instrumentation Products, "and supports eight languages and three character sets. It has been designed and tested to have the best EMI/RFI noise immunity in the industry to prevent interference from cell phones and handheld radios." The QRAE II instrument can be powered by either rechargeable lithium-ion batteries or standard alkaline batteries. The large display on the QRAE II can be "flipped" to the orientation of the worker for either handheld or belt mounted operation. The QRAE II also includes a new visual graph display in addition to the actual sensor readings. The QRAE II features easy access to the filters, battery, and sensors without exposing electronic components, making field changes both safe and quick. The product has both CSA (for use in the Americas) and ATEX (for use in Europe) certifications for safe use in potentially explosive environments and is IP-65 rated for water and dust resistance. The unit supports eight languages: Chinese, English, French, German, Italian, Korean, Portuguese, and Spanish, and the operator interface is the proven two-button system pioneered by RAE Systems to work even with dual-layer gloves. The unit includes vibration, flashing LED and loud 95dB audible alarms to keep workers safe and aware in a mix of environments. The QRAE II is available in pump or diffusion models or in a confined space entry kit that includes tubing, sample probe, tool kit, calibration gases, and a hard case. 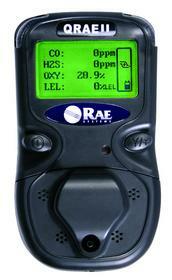 For more information on the QRAE II or RAE Systems family of toxic gas monitors, including the five-gas MultiRAE Plus and wireless AreaRAE, please visit our website at www.raesystems.com.